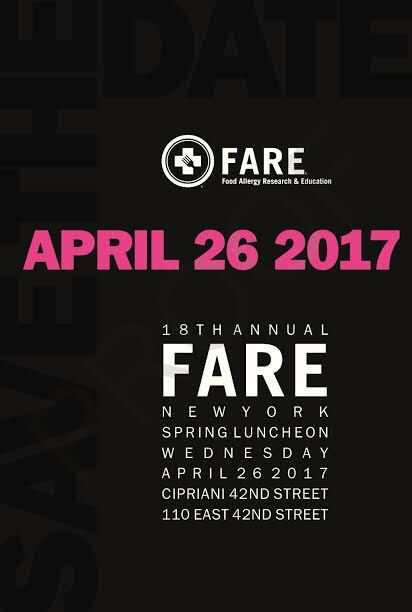 (FARE) @ Cipriani 42nd St. 11:00 am. All proceeds will benefit FARE, a national nonprofit organization with the mission of improving the quality of life and the health of individuals with food allergies, and to provide them hope through the promise of new treatments. The Legacy Award will be presented to Roxanne and Amanda Palin for their commitment to FARE and for raising awareness of the seriousness of food allergies. WABC-TV news anchor Lori Stokes, who is personally affected by food allergies, will be the mistress of ceremonies. Advisory Service Team are the Event Advisory Chairs. Jolie Goldring, Nicole Lenner,Melissa Meyers, Kim Raimondi, and Jennifer Fisherman Ruff are the Raffle Co-Chairs, Jessica Mukasey Barkoff, Elizabeth Hecker, Lisa Jacobs, Sarah Kugelman and Jamie Lichtenberg are the Goodie Bag Co-Chairs. $15,000, $10,000 and $7,500, and individual tickets are available for $5,000, $2,000, $1,000, and $500.